Welcome to Digital Health Briefing, a newsletter providing the latest news, data, and insight on how digital technology is disrupting the healthcare ecosystem, produced by Business Insider Intelligence. DIGITAL HEALTH TECH IS BECOMING MAINSTREAM:Consumer adoption of digital health services is blowing up and demand is unlikely to wane in the near future, according to a new Accenture study. The results from the survey of 2,301 consumers demonstrate that not only are consumers already using multiple tools to manage their health, they’re also excited about the next wave of technology on the horizon. mHealth app use is exploding as a means of convenient health information retrieval and storage. As of 2018, just under half of all respondents say they’re using mobile health apps compared to 16% in 2014. Forty-four per cent of respondents have used online portals to access electronic health records in the past year. Wearables are part and parcel of healthcare.Three-quarters of consumers are using health and fitness wearables, such as Fitbits and Apple Watches, to understand their illness, 73% to monitor and manage their health, and 73% to monitor the health of friends and family. Meanwhile, consumers are excited by the potential of emerging technology to bring clinical procedures and administration into the home. This includes devices for home blood tests and having virtual assistants – like Siri or Alexa – help with health insurance, making appointments, and offering home healthcare. This enthusiasm comes despite the likelihood that these technologies are years away from mass market. The study highlights the advantage that healthcare organisations can gain by offering digital health options. Observing consumer demand is more important than ever, as patients become more fickle about how they access their healthcare, according to a 2017 survey by West. 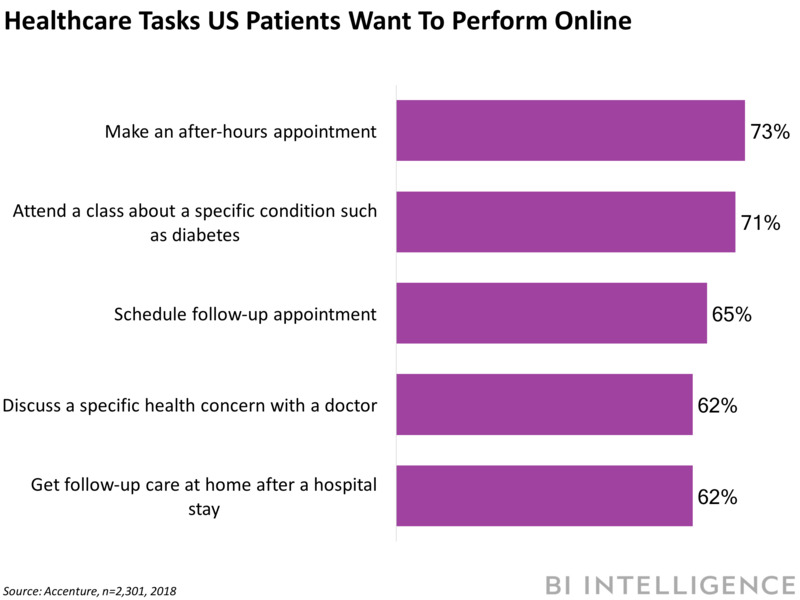 Providers and payers that enable consumers to access popular features, such as booking appointments online, AI-powered mHealth apps, and virtual visits, will be more likely to retain their customer base. NEW YORK PATIENTS HIT BY LARGEST HEALTHCARE DATA BREACH IN TWO YEARS: The medical records of more than 135,000 patients could be affected by malware that hit St. Peter’s Surgery and Endoscopy Center in New York, according to Compliance Junction. Hackers may have gained access to patient information such as names, addresses, dates of birth, dates of service, diagnosis codes, procedure codes, and insurance data. Some patients also had Medicare information accessed, which includes social security numbers. The breach only affected patients who had visited this specific center -because St. Peter’s Surgery use a separate server. Despite the severity of the data breach, it could have been much worse. Firstly, the breach was detected in January 2018, the same day hackers gained access to St Peter’s Surgery’s servers, which likely mitigated further damage. Additionally, because St. Peter’s Surgery uses separate servers from its affiliated clinics, patients at St. Peter’s Hospital and Albany Gastroenterology Consultants weren’t affected. Cybersecurity is an ongoing concern for the healthcare industry. Four in five US doctors have experienced a cyberattack of some sort, according to a study by Accenture and the American Medical Association. Despite this, a majority of US healthcare businesses lack a cybersecurity leader. Just 15% of organisations have a designated C-suite leader to manage enterprise-wide data security efforts, according to a recent Black Book Research study. As more of the medical industry goes online, the impact data hacking and internal errors will have on patient records and hospital operations will continue to grow. It’s becoming more important than ever for healthcare organisations and systems shore up against these threats. 23ANDME GETS INDUSTRY-FIRST FDA APPROVAL FOR HOME CANCER TEST: On Tuesday, the US Food and Drug Association (FDA) approved 23andMe’s direct-to-consumer testing kit for genes linked to some forms of cancer, according to TechCrunch. Consumers can order the kit through 23andMe without a prescription. The test analyses DNA from a self-collected saliva sample, and looks for the presence of the BRCA1 and BRCA2 genes, which are linked to higher risk of ovarian, breast, and prostate cancer in some populations. The results of the test are presented to users online. The announcement is a boon for 23andMe, providing the company with a first-mover advantage in the increasingly competitive personal genetics-testing market. More and more, consumers are looking for more convenient ways to manage and monitor their health. In 2017, the number of consumers who used a direct-to-consumer DNA test doubled, exceeding 12 million, according to industry estimates. These consumers were primarily from the US. Furthermore, as 23andMe expands the number of tests its kits can analyse, its data caches will become more valuable to researchers and healthcare systems. With users’ permission, the data collected from home DNA kits can be used by medical researchers and institutions for studies and research into things like population health and precision medicine. And although the FDA approval has already spurred a debate about the dangers of direct-to-consumer tests, it’s also likely to open the floodgates for other companies, such as Ancestry.com and National Geographic to seek similar approval. WEARABLES ARE HELPING TO CREATE A VIRTUOUS CYCLE OF GOOD HEALTH BEHAVIOURS: Wearables are boosting employee engagement and motivation, according to a panel at the Personal Connected Health Alliance’s Innovation Leaders’ Summit at HIMSS18. The three panelists included Castlight Health President Derek Newell, Fitbit Health Solutions COO Amy McDonough, and UnitedHealthcare VP of emerging products Paul Sterling. The discussion centered on how wearable technology is being used to convince employees to engage in health and wellness behaviours, such as exercising and sleeping well. For example, UnitedHealthcare’s Motion program pays users up to $US4 each day to meet specific health goals – tracked via wearables like Fitbits and Samsung devices – which is deposited into their HSA or HRA each quarter. This can turn into a virtuous cycle, where employees earnings to pay for other health improving items. An active and healthy workforce benefits both employers and payers alike. Healthy consumers are less likely to get sick or suffer from chronic illnesses, which reduces the burden on payers. Meanwhile, productivity losses associated with absenteeism caused by injury and sickness costs US employers $US225.8 billion annually, according to CDC.